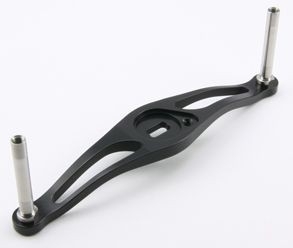 Handles on this page accept 8mm main shaft, which is employed on Daiwa and ABU bait casters. For ABU1500C-2500C reels, please choose only metal handles with less than 3mm thick frame, or handles may not be fastened on shaft for lacking threads. 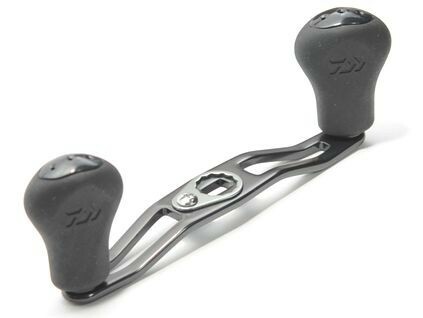 Shimano Conquest, TE and TE-GT in 300,400, 401: have the 8mm shaft, and handles on this page fit. Please purchase M8 hooded nut for them. Its stock nut is 11mm hex size and won't fit with retainers. Knobs fitting to these handles are listed on Tuning Knobs Sway back handles mostly require sway back star drag, unless indicated. *1 For Daiwa with 12mm handle screw models, please choose SCR model or purchase either of DS 10mm screw for ZPI handles, or Handle Screw 10mm for other handles. 12mm screws are on: Steez EX100XS/HS, Ryoga JDM, Daiwa-Z JDM, Zillion J Dream, Zillion PESP and etc. 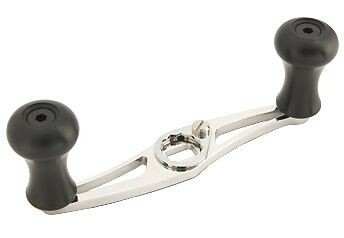 Handle is fastened by handle screws with 12mm heads, which do not fit to 10mm retainers of tuning handles. If you are not sure if the tuning parts fit to your tackle, please Email Jun Please refer to here as well. Replacement knob rubber for DRT 95/100 handles. Slim black rubber is installed to DRT handles originally. Doesn't fit to any other handle than DRT 95/100. 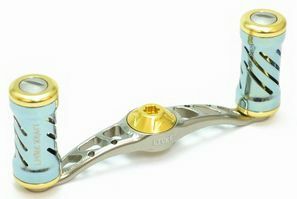 DRT Varial custom handle 87mm (without center nut) 2018 Winter Limited offer! 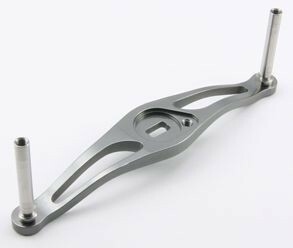 DRT Varial handles are full machined heavy duty handles for big baits. 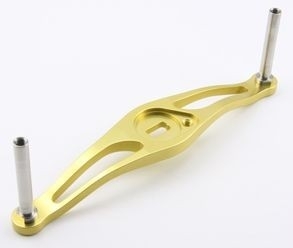 DRT Handle center nut is not included, and please purchase at least one or you may not fit the handle to reels. Handle plate is quite thick 6mm at center to offer SOLID cranking. Stiff rubber knobs are large enough to grip firmly. Accept straight star up to 27mm radius, and sway back star drags. Made in Japan DRT replacement knob rubber is not fitting to 85mm handles. Fits to reels with sway back star drags. Daiwa Zillion, Steez and etc. Please purchase sway back star drags for the reels with straight arm star drags. Comes with 4 ball bearings, a black retainer and a screw. Accept Daiwa S knobs. 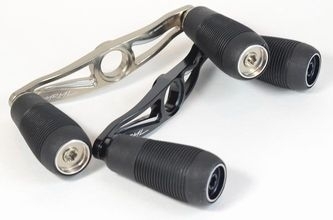 100mm light weight duralumin handle with EVA knobs for power cranking. Comes with retainer and screw. Fits to all Daiwa and ABU bait casters. *1 Handle frame is sway back and requires sway back star drag, or star will contact to the handle. Fits to reels with sway back drag wheel. Daiwa Zillion, Steez. 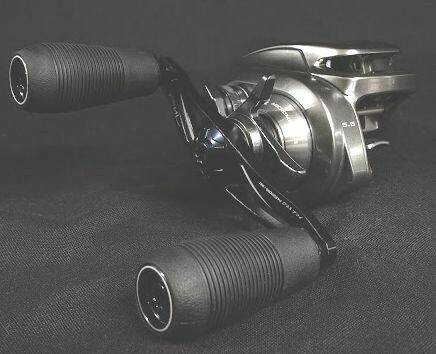 For other Daiwa models, please purchase sway back star drags. Comes with 4 ball bearings, black retainer and screw. AcceptDaiwa Sknobs. 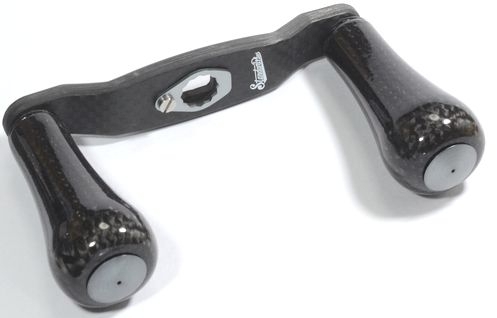 Super powerful 88mm carbon frame handle with 52mm long carbon knobs. 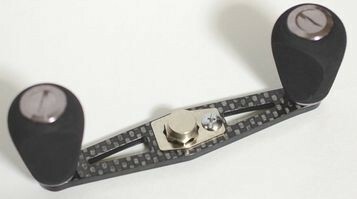 5mm super thick carbon frame holds knobs solid. The long grips offer super cranking power. Surface of knobs is coated with rubber paint for better gripping. 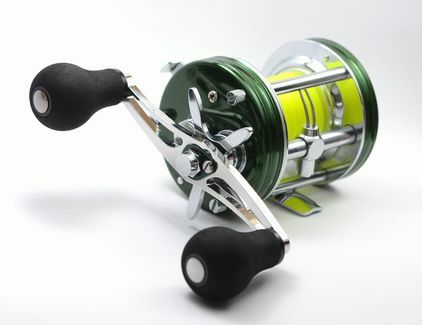 Comes with 4 nuts(Shimano 7mm R/L, Daiwa/ABU 8mm R/L), 7mm/8mm shaft adapter, retainer and screw. Fits both to Shimano and Daiwa/ABU bait casters. 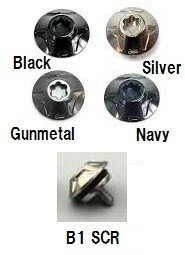 For Daiwa handle screw reels, please purchase DS nut. No sway back star drag needed. 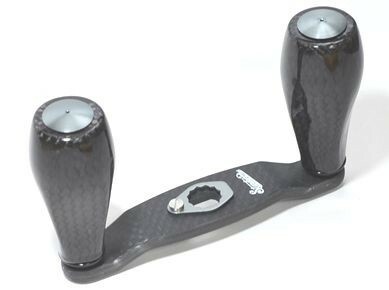 Super powerful 92mm carbon frame handle with 52mm long carbon knobs. 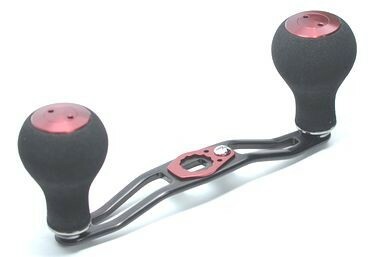 5mm super thick carbon frame holds knobs solid. The long grips offer super cranking power. Surface of knobs is coated with rubber paint for better gripping. Comes with 4 nuts(Shimano 7mm R/L, Daiwa/ABU 8mm R/L), 7mm/8mm shaft adapter, retainer and screw. Fits to almost all Shimano, Daiwa and ABU bait casters. No sway back star drag needed. For Daiwa handle screw reels, please purchase DS nut. 90mm Light weight 3mm thick aluminum frame handle with camo EVA knobs 26mm dia. Comes with retainer and screw. Fits to all Daiwa and ABU bait casters. *1 Handle frame is sway back and requires sway back star drags. 4 ball bearings installed. Please lube the bearings with grease or thick chain lube before using. 90mm Light weight 3mm thick aluminum frame handle with black round EVA knobs. Comes with retainer and screw. Fits to all Daiwa and ABU bait casters. *1 Handle frame is sway back and requires sway back star drags. 4 ball bearings installed. Please lube the bearings with grease or thick chain lube before using. 90mm Light weight 3mm thick aluminum frame handle with black flat EVA knobs. Comes with retainer and screw. Fits to all Daiwa and ABU bait casters. *1 Handle frame is sway back and requires sway back star drags. 4 ball bearings installed. Please lube the bearings with grease or thick chain lube before using. 80mm long, classic looking handle with rose wood knobs. Knobs are fastened to shafts with screws, and you may clean the internal by removing them. Comes with retainer, screw and R nut. Fits to ABU 1500-6600. 40mm long, classic looking handle with a rose wood knob. Knob is fastened to shaft with a screw, and you may clean the internal by removing it. Comes with retainer, screw and R nut. Fits to ABU 1500-6600. 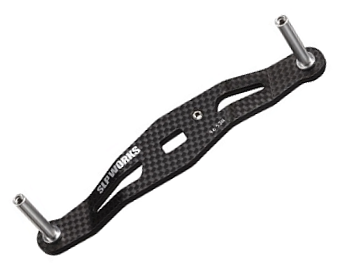 95mm flat frame Carbon Fiber Handle. This handle measures about 3mm longer (85mm overall) than the stock Abu handle (82mm) and has contoured EVA grips to grab hold of and weighs in at 0.83oz!!! (25 grams). The knobs will stay warm to the touch in colder temperatures and are really easy to grab. 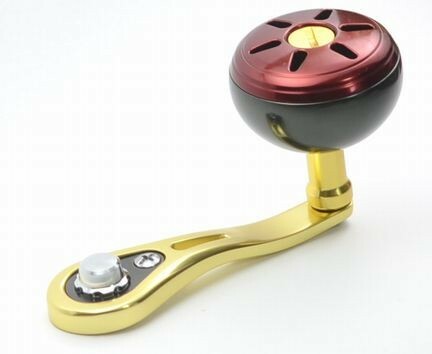 Each knob spins on two stainless steel ball bearings....four in total! Knobs are removable for cleaning too! The carbon handle shank measures over 1/8" thick (3.66mm) and is really stiff. The place on the shank where the nut sits is bored out a bit to allow the nut extra threads to grab onto. It will add cranking power like you've never felt before! This is an easy way to add smoothness and decrease the overall weight of your baitcaster. Each kit comes with the handle, right handle nut, and locking screw. 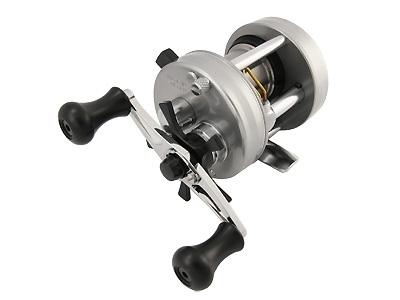 For left hand reels, please purchase an M8 hooded nut for left hand separately if you don't have it. Sway back, Extra Super Duralumin(ESD) handle frame fitting to almost all Daiwa/ABU bait casters. Avail handles are the piece of craftsman-ships. It is super light weight. 85, 90, 95, 100, 105mm, weight 13.2g 100mm. Color: Champaign gold, gunmetal, black. Fits to ABU: REVO with sway-back handles, Daiwa: Steez, TD-Zillion, Zillion TW and etc with sway-back star drag. For other Daiwa and ABU reels with straight star drags, please purchase sway back star drags together. Accept Daiwa S, Shimano A, knobs. Comes with retainer in the same color as handle frame, and screw to hold the retainer. T4S 100mm Chrome on ABU6500CS Green, with Avail EVA knobs, Avail GM knob caps Chrome, Avail Green Retainer. ESD air-craft grade dulalumin frame, 64 titanium knob shafts. 4 ball bearings installed. Solid, powerful, smooth yet in classic looking handles. 70, 75, 80mm length. Frame color black, gunmetal, silver, chrome and red. Comes with a retainer for hooded nut and retainer screw. Fits to all ABU 1500-6600, Daiwa bait casters. Retainer fits to 10mm hex nuts, which are used on most ABU and Daiwa. 90mm swept, machined aluminum frame, titanium knobs All Daiwa and ABU bait casters. *1 No sway back star drag needed. Please specify right, left or SCR. For Daiwa reels with handle locking screw, instead of nut, should choose SCR. For Ex., Ryoga, Z, Zillion special models, Steez, Zillion TW and etc. 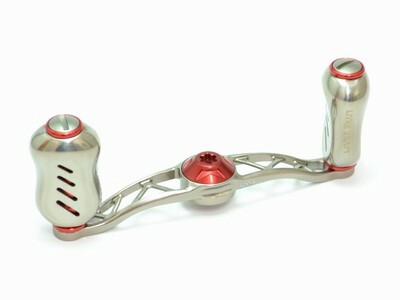 85mm swept, aluminum billet frame, titanium knobs,Sample All Daiwa and ABU bait casters. For Daiwa reels with handle screws like Steez, Ryoga, Pluton, and Daiwa-Z, T3 and etc, please choose "SCR." 100mm swept, machined aluminum frame, titanium knobs All Daiwa and ABU bait casters. *1 No sway back star drag needed. Please specify right, left or SCR. For Daiwa reels with handle locking screw, instead of nut, should choose SCR. For Ex., Ryoga, Z, Zillion special models, Steez, Zillion TW and etc. 75mm long single power handle with 44mm dia large knob for Daiwa/ABU bait casters, and 00/15Shimano Conquest 300/400. 2 ball bearing installed. Fits to Right hand reels with 8mm shafts. Comes with a nut (R), retainer, and screw. Best for Millionaire 300, ABU 6500/6600 and Conquest 400. Colors match perfect with Gold of Conquest. Daiwa star wrench is required to turn nuts. For left hand reels, Daiwa Star Nut M8 Left is required. 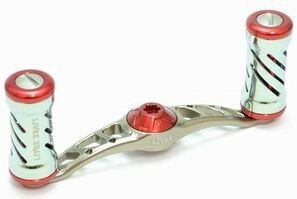 Accepts sway back star drag, and straight shaped star drags of up to 60mm diameter, fine for most ABU 1500-6600 and Daiwa.